How to Fix the Issue that M4VGear Fails to Read iTunes Movies? How to Fix the Issue that M4VGear Fails to Read Your iTunes Movies? 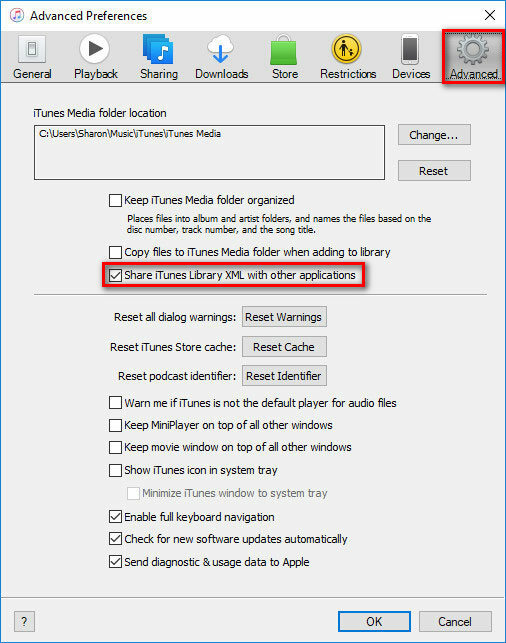 Please launch iTunes, go to the Menu column on the upper left corner and select "Edit ->Preferences -> Advanced", tick "Share iTunes Library XML with other applications" and then click "OK" to save the settings. Step 2: Click “Retry” to Load Your iTunes Movies. Go back to M4VGear and click "Retry" to re-load your iTunes movies. Note: If the issue can’t be fixed by the solution above, please send an e-mail to our support team at support@m4vgear.com and attach your iTunes Library.itl file as well.